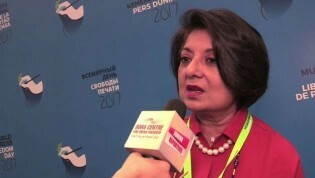 The Doha Centre spoke to Farhana Haque Rahman, Director General of IPS about media development and defending press freedom, at the World Press Freedom Day Conference in Jakarta, Indonesia. This year’s theme for the 2017 World Press Freedom Day “Critical Minds for Critical Times: Media’s role in advancing peaceful, just and inclusive societies” is one of the most important days honouring press freedom. The widespread belief in the politically-motivated killings of journalists in Sri Lanka is predicated on a deadly irony: the hidden hand has always been visible, but the fingerprints have gone missing. Images of protestors flooding the streets – whether in Caracas, Bucharest, Istanbul or Washington DC – send a powerful message to those in power, especially when they are plastered across newspaper front pages. Would you trust your news from any source? How are we able to ensure that ‘fake’(d) news does not overtake the flow of information? In the politically-risky world of professional journalism, news reporters are fast becoming an endangered species. Taha avoids giving his last name to journalists, but not out fear of the Sudanese government, whose harassment he fled in 2015. Rogue interests, perhaps even foreign, are said to be trying to interfere with the electoral process in the U.S. and European Union members. Senior government officials glibly endorse what they themselves call “alternative facts” and even openly describe the media as their enemy. Journalists are not only major users of the cherished right to freedom of expression but also symbols of the extent to which a society tolerates and promotes freedom of expression. The current state of safety of journalists worldwide is alarming. Over the last decade 827 journalists and media workers have been killed. Even more alarming is the fact that in less than one out of ten cases have the perpetrators been apprehended.